Editor’s Note: The sparsely populated area of Byron has been host to scores of photographers over the past five years. It is a place of great fascination for anyone who is privileged to see it in person. Yet few know of the history of the springs and their significance. This two-part series will explore the religious history of a famous site East of San Francisco. Although the religious portion of its history is such a small part of its amazing saga, I hope it will help you better understand this unique landscape. All modern photos are taken by me. The black and white images were retrieved from the Bancroft Library of U.C. Berkeley. Please stay tuned for Part 2! The aim of this overview is to focus specifically on the religious connotations of a localized collection of springs for the Greek Orthodox Church. 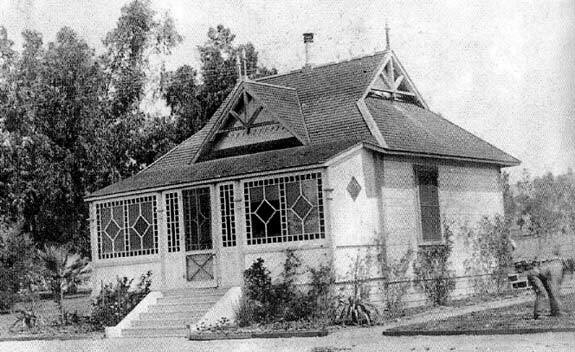 Though the period of the Orthodox’s presence at Byron Hot Springs is from 1946-1956, Byron still served as a spiritual pilgrimage point as far back as the pre-Spanish era of California. A present-day photo of the hotel. Unfortunately recent years has seen increased vandalism and destruction of the hotel’s only remaining building. In 2003 a fire destroyed what remained of the nearby Victorian cottage. Byron reached its height in the early-1900s, declined during the Great Depression, served as a temporary top secret military prison camp, and then finally became consecrated for the Greek Orthodox Church. Much of my analysis will involve sources from the resort’s pre-Orthodox era; however, the sources and quotations drawn from this era further solidify the symbolic definition of the site and will lead credence to its selection as a religious pilgrimage point that suited the needs of the Church perfectly. The following claims will be drawn from a variety of primary sources and will be divided into two thematic headings. Visual evidence will be cited with a link to its corresponding item. As one enters the landscape of Byron, it becomes an obvious natural oasis in a grassy, alkali and sagebrush-covered landscape. 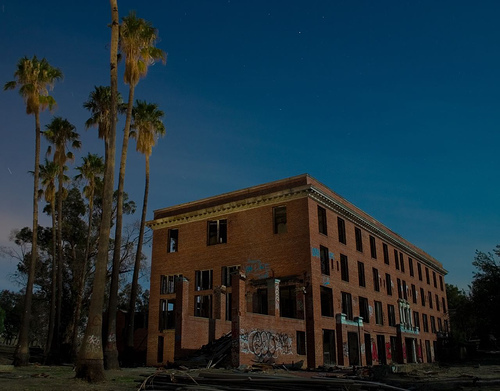 The plot has seen three different hotels, two of which burned down — the third, and current hotel, is made entirely of brick. Fire hydrants surround the edifice — a testament to the architects getting smart to fire hazards. Early photo of the extensive landscaping effort. Dirt was trucked in to cover up the alkali and barren landscape that occupied the springs prior to Western arrival. Around the hotel are the vestiges of the past Edenic garden that surrounded Byron. The architect spared no expense in turning the land into a lush landscape reminiscent of a Mediterranean retreat. He ensured that the alkali dirt would not hinder the garden’s progress by trucking in tons of soil. Non-native Indian pepper trees, pomegranate, and palm trees dot the landscape. Of course, the springs themselves, the very centerpieces of this retreat, required an effort no less exorbitant. Originally, these places were simple watering holes, embellished with hand-carved stones that resemble the natural landscape. 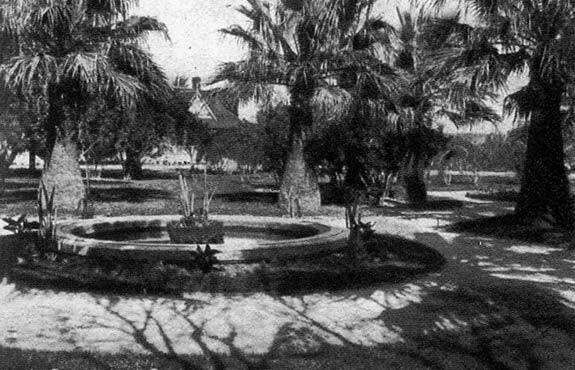 In its early Era, the springs were an undeniable Romantic-era notion of beauty. A romantic-era notion of beauty in nature. Byron’s early springs merely had hand-chiseled rocks as signage, which indicated the location of each spring. The springs all had their own unique curative powers — from constipation to alcoholism or lethargy — the springs at Byron healed them all. But hidden beneath the symbolic surface of these Romantic-era creations are a number of religious and spiritual undertones. The extent to which these features of the Byron landscape played into the Greek Orthodox church’s purchase of the site may not be readily apparent, but my intention is to highlight the very real elements that may have made it a desirable site for the Church and its activities. I had earlier noted the Mediterranean influence of the landscaping. Pomegranate, pepper, and palm dominated the landscape — all three very much reminiscent of the Greek Orthodox’s own Mediterranean mecca. The Greek Orthodox Church was — and still is, to a large degree — very much a new immigrant denomination. Its members during the Church’s purchase of Byron were overwhelmingly first-generation Americans who carried their own affinities for the flora of their homeland. 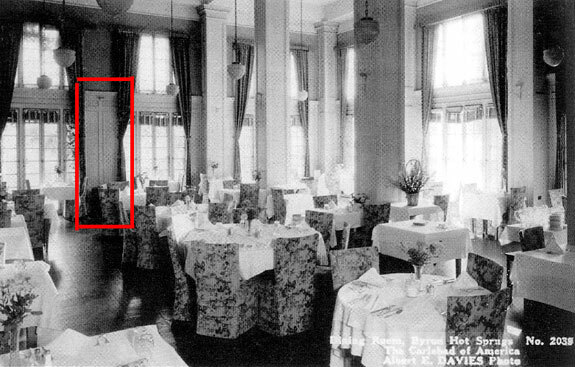 Even the grand dining room of the Byron Hotel was imbued with religious undercurrents. The cross is highlighted in the red box. 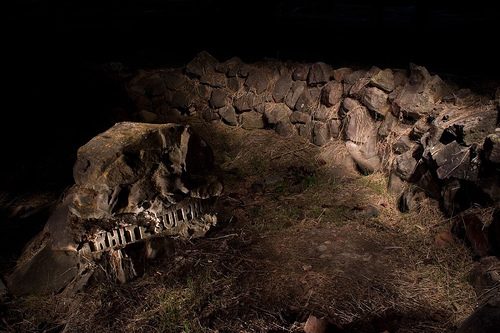 Beyond the ecological aspects of the site, the human-built aspects also had their own symbolic connotations. The dining area contains its own subtle, subliminal icons. Note the cross-like woodwork, integrated in the pillars. Also note the early image of people drinking from the Liver and Kidney springs — in an eerie, foreboding of this site’s future religious purpose you can see a faint shadow of a cross above the woman’s Progressive-era sun umbrella. 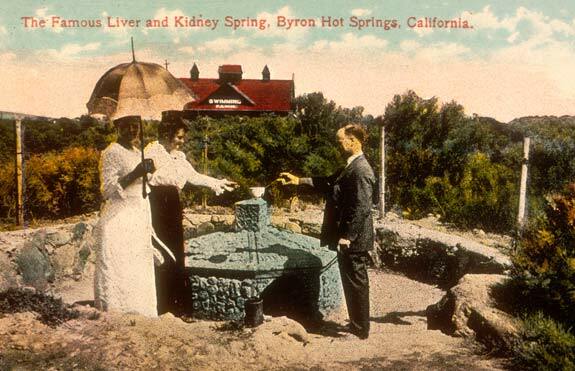 The famous Liver and Kidney springs at Byron. Note the religious connotation in the distant specter of the cross to the top-right of the woman’s umbrella. Perhaps most striking, however, is the now-demolished Liver and Kidney Spring structure. On top of this spring, the widow of the early proprietor of Byron built a memorial to her husband. The Mead Memorial was “long, spacious, cool, and light-filled. It held a combination medical room, sanctuary, and baptismal quality for its visitors. The concept of ‘drinking at the well’ had religious overtones to some. 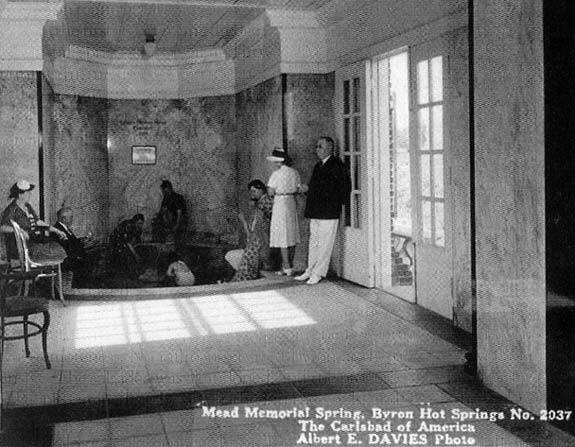 The Mead Memorial spring at the Byron Hotel in Byron, California. This was perhaps the most spiritually charged building of the entire hot springs complex. Unfortunately the Mead Memorial was demolished in the late 1970s. Jensen goes on to write in her caption for this image, “Perhaps for this reason, the Greek Orthodox church sanctified the building into the ‘life-giving spring’ during the resort’s tenure as Mission St. Paul” (Jensen 40). The “Zothohou Peeyee” — a moniker given to the Liver and Kidney Spring when the Orthodox Church dedicated the resort as their own — was not only religious, but it also featured seemingly secular paintings akin to John Constable, Thomas Cole, and Thomas Moran. Even these paintings, which included mountains, valleys, and streams, all had their own transcendentalist religious notions. The Church added to this ambience by placing their own altar and religious icon. Finally, it is worth mentioning the craftsman-style cottages that adjoined the main hotel, built more than six decades before the church bought the resort. Though the craftsman style is generally not aligned with religious use, the cottages at Byron had something that set them apart as peculiarly religious: stained glass windows in the verandas, a common theme among Greek Orthodox cathedrals and churches — undoubtedly an influential quirk that the church may have found familiar. Craftsman-style homes at Byron Hot Springs. The significant feature of these homes seems to be their front windows, which appear to be stained-glass in nature — another incentive for the Greek Orthodox church to purchase the property in the late-1940s. Next week we’ll conclude this two-part series with a wrapup of the other religious artefacts of Byron. I hope this first part was enjoyable and please feel free to comment with your own input! This entry was posted on Sunday, January 18th, 2009 at 3:41 pm	and is filed under Built Environment, Geotagged, History, Must See Geography. You can follow any responses to this entry through the RSS 2.0 feed. You can skip to the end and leave a response. Pinging is currently not allowed.